and for other devices you can access via your mobile browser. Quotestream Mobile is a fully synchronized companion to Quotestream Desktop delivering comprehensive portfolio management and a broad range of financial data, news, and charting to your mobile device. It is a powerful, user-friendly mobile solution that keeps you connected to critical financial information when you are on the go. The Quotestream Mobile service is available to all Quotestream users featuring mobile access to the same Portfolios, Watchlists, and Market data entitlements that exist through your Quotestream desktop application. They are completely integrated, so that any changes made to portfolios and watchlists in either application are automatically reflected in the other. Monitor all of your stocks, funds and options as they update, live! Create up to 10 portfolios or watchlists of up to 52 symbols in each. Keep informed with recent press releases pertaining to your portfolio symbols. Just click on the headline and read the full story. Setting up and maintaining your portfolios is simple with Quotestream. Complete setup and customization takes only minutes on either Mobile or Desktop versions. As the Watchlist is fully integrated with the Desktop, each one has up to five columns that coincide with the Desktop Watchlist module display. Looking for fundamental data at a glance? Complete details are readily available for any company or fund. At anytime, click to delve deeper into what's going on behind the last trade with a particular company. See what trades are happening, and when. Streaming NASDAQ Level II and TSX/V Depth keeps you up-to-date with what's going on behind the bid and ask. Essential for the active trader. Check the daily trend of any particular investment with a click. If you are looking for long term trends, use our 5 day chart, or up to 3 years, with Candlestick, Line, Mountain, or OHLC charts. 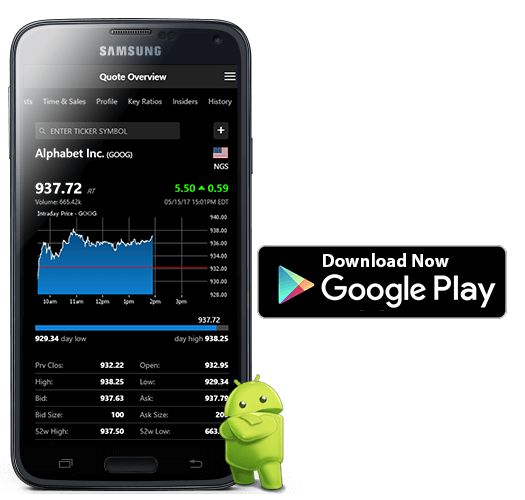 Monitor the markets right from your mobile device. Instant quotes and graphs are a click away, right when you need to know. If FOREX is your focus, easily access the Foreign Exchange screen and keep up on what's happening with the major world currencies. At glance you can find out which companies are most active in the market. Most Actives, Gainers, and Losers are grouped by exchange. This is a predefined list of popular U.S. and Canadian Rates. Can't remember a company's symbol? No problem. Quotestream Mobile comes with an easy to use symbol search. This is a tool for foreign currency conversions. Enter the amount and click the From and To fields to display a list of country currencies for the conversion.